Get ready for game day in style and personalize this easy to paint tailgating table with the name of your favorite team, from Krylon. Krylon Indoor/Outdoor Paint - Pumpkin Orange (#52411) or a color that coresponds to your favorite team! Use ammonia-based cleaner and lint-free cloth to clean surface of table. If table is new, wipe down with paint thinner instead. Let dry completely. Apply painter’s masking tape to the outside edge all the way around the table (this will give a clean white border along the edge later). Measure for the center of each long side of the table and mark with a pencil on the masking tape along the edge. Using these marks as a guide, tape a length of masking tape straight across the middle of the table. Your table is now separated into 2 halves. Measure to divide the halves into 6 equal sections on each half, for a total of 12 sections across the table. Mark with a pencil on the masking tape along the edge. Using these marks as a guide, tape lengths of masking tape straight across the middle of the table. 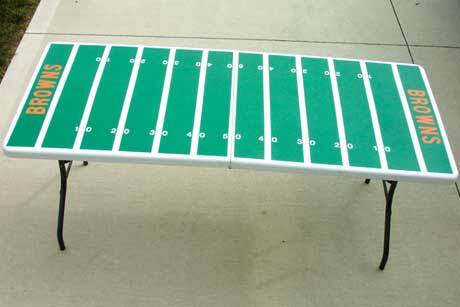 A few inches in from the edge of the table, apply vinyl numbers so that the “yard lines” are marked. Use photo as a guide, and use measuring tape or a ruler to help you keep the numbers straight as you adhere them to the table. Make sure all the edges of the tape and numbers are firmly adhered to the table. Use your fingernail or something with a hard edge to run along the edges carefully. You want your paint lines to be crisp & clean when you paint. Using masking tape and newspaper, cover sides of table and surrounding areas to prevent overspray. Following instructions on can, apply Fusion Spring Grass to tabletop. Use several light coats rather than one heavy coat for best results. Once tabletop is completely covered, let dry completely. Very carefully, remove masking tape and numbers. Fusion isn’t fully cured for 7 days, so if you aren’t careful, you could scratch the paint. Following instructions on can, spray vinyl letters with Indoor/Outdoor Pumpkin Orange (or one of your team’s colors). Let dry completely. Remove vinyl letters from the sheet they are on and apply to table in the “end zones”. Refer to photo and use measuring tape or ruler to help you position the letters. It can be easier to work from the center letters out towards the ends to get everything centered properly. Have a little patience with this step as bigger letters take a little time to get positioned straight. Touchdown – your table is ready to take to the next tailgate party. Amaze your friends – they’ll all want you to make them one!